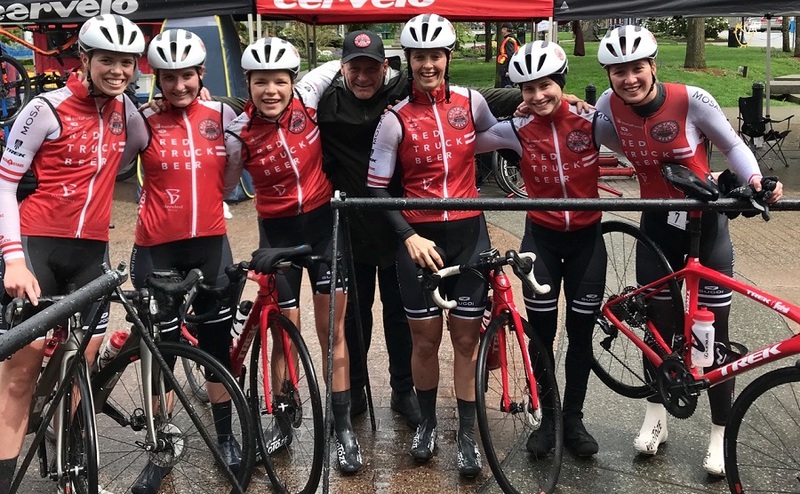 The women rolled up to the race with the team plan in our heads and ready to tackle Saturday’s double header day, an 80km road race in the morning and a 4km uphill Time trial in the afternoon. The pace picked up quickly and so did the rain! Within the first three laps we launched a couple of strong attacks and the third one stuck! With Michelle and Erin in the breakaway with two other riders, we were happy but running scenarios through our heads of when to counter if it gets brought back, or who should try and bridge to the breakaway. Having teammates to race with has completely changed the way I enjoy bike racing. The race came down to a sprint finish with Holly coming in second. After huddling in the team van for about an hour, it was time to put new kit on again and go back out into the pouring rain to do a ten minute effort. “Its only ten minutes” was a phrase that I kept running through my mind as we all layered up to go back out. Luckily the first 2kms of the race are rolling, I gained as much time as I could and caught my 30sec man which is always a confidence boost! I hit the hill hard, my glasses fogged up, I kept going and knew there was only one corner, I couldn’t get lost. I rode hard through the finish line and immediately turned back around to ride back to the cars. Michelle placed second and I placed third in the hill climb with our other teammates very close behind! My favourite event of any stage race! An even better criterium is when it’s pouring rain and the course has lots of corners. Ever since I started racing a little over three years ago, I have always liked criteriums. Perhaps it’s my quick sprint from speed skating or my cornering technique; either or, I love to go fast and criteriums on a small course is when the speed never lets up. We set the pace high right from the gun, stringing out the field. Three TRT’s were in the top five positions and ready to cover any attack. After a small crash, three of us managed to get off the front - Holly, myself and he GC leader. We had gotten a pretty good gap and after going for a prime lap donated by our sponsor InstaFund we had caught the main bunch! We mixed back in with our team and went back to the plan of attacking! After a couple more moves we were chased down; Holly, Erin and I were off the front again with two other riders. Holly put in three strong attacks to tire out the group and I was waiting patiently for the opportunity to attack solo. After another prime lap the small group we had out front came back together, there was a lull and I attacked, hard. I put my head down and pedaled through every corner with nine laps to go. I rode by Steve, Brian, and Leah every lap they would call out the time gap and some much-needed encouragement! After keeping the gap at around 20 seconds for a couple of laps I looked over and saw the group, one girl was pulling them all; it was me against her. The gap between us started going up, I could no longer see them on the opposite straight away - it’s working! With three laps to go the main bunch appear in front of me, I catch them and ride straight up the right-hand side to the front of the group - I had just lapped the field for the second time! The bell rang, and I had one to go. I guess the bunch was a bit confused, they sprinted around me for the finish, got to love bike racing! I still won, just amid the group. Holly came second in the general classification and I came third. We are still chasing the top step but it will come soon!